This is the fourth example of Retay Arms' Masai Mara semi-automatic shotguns I've reviewed. This “Bronze Pure” model features polished blue, very attractive oil-finished walnut, and the exceptional machining and build quality that easily makes it the best-looking, best-built, and best-performing semi-auto to be imported from Turkey. It puts several shotguns to shame, for example the Benelli Ethos I tested that has lesser walnut, and more plastic. In the case of the evaluated 26 inch barrel Benelli Ethos, the heavy trigger, heavy safety (10 lbs. ), heavily over-rated recoil reduction, and heavy price all combined to make the Ethos a lackluster shotgun, not comparing favorably to Benelli's own M2 and Vinci as a general hunting shotguns, both which retail for $500 - $600 less and are a lot more fun to shoot. The Ethos is light, though, at 6 lbs. 7 oz.. Unfortunately, the heavy trigger of the Ethos breaks at over 6-1/4 lbs., and the poor placement of the pistol grip makes reaching the trigger a bit clumsy. The black anodized Ethos that I tested has an MSRP of $1999, which is not what anyone could refer to as a bargain: the nickel receiver adds another hundred dollars to that. This Retay Masai Mara Bronze Pure retails for roughly half the price of the Benelli Ethos at $1095: https://shotgunsdirect.com/collections/masai-mara-shotguns/retay-usa . Yet, it has better wood, an easier to get off safety, and a slightly better trigger. In the case of this specific model, the trigger is still excessively heavy, breaking at 6 lbs. The trigger guard is anodized alloy, not the prevalent cheesy, injection-molded fodder of the Benelli. The forearm cap is also alloy, not plastic. With this Masai Mara, though far more satisfying than the overpriced Ethos, there is still room for improvement. The trigger is too heavy and the cross-bolt safety is too small for cold or gloved hands. At 6 lbs., 15 oz., it is a tad heavier than the Ethos, but lighter than the 3 inch Benelli M2, the Weatherby Element, the 3 inch Vinci, and so forth. The Weatherby Element Waterfowl Camo is the heavyweight of the category, at 7-1/4 lbs., also with a 6-1/4 lb. plus trigger. Retay Arms patented “Inertia Plus Action” eliminates the annoying “Benelli Click” found on all other Civolani-action based guns, excepting the Ethos and the SBE3. The Masai Mara has a push-button quick release trigger assembly, and an easily replaceable ejector. Both of these features are relatively unimportant to me, personally, but the quick-release trigger is at least something to put in the “nifty and spiffy” category. Drop at the comb is 1.45 in ±.04 inch. Length of pull is 14.37 inches. The ventilated rib is 8mm wide, wider than the standard 6mm hunting rib, and the gun has a 3 inch chamber. The barrel lengths are 24, 26, 28, and 30 inch: however, there are no 24 inch barreled Masai Mara models in the U.S. as of yet that I know of, but I'm told they are coming. That gives you more choices in barrel lengths than many inertia guns, where you are often limited to only 26 inch or 28 inch. The “Bronze Pure” designation refers to the bronze Cerakote coated receiver: it brings out the walnut beautifully and it is more durable than anodizing. As with all Masai Mara models, this gun comes extremely well presented in a hard case, with five flush choke tubes, a snap cap, shims, and a bottle of gun oil. The five year warranty is handled by Briley. For those looking for high-performance choke tubes, Trulock has them in production right now in Sporting Clays and Precision Hunter Styles, https://trulockchokes.com/ . When Turkish shotguns are referenced, you don't often hear much about innovation or creativity. That's what sets Retay Arms apart: the patented Inertia Plus bolt system, push-button release trigger guard, the removable machined ejector all show that they have gone the extra mile. The Masai Mara is currently offered with more receiver finish choices than anyone in the industry, from anodized black and camo to silver, grey, satin, and bronze Cerakote. Everything that comes with the Masai Mara is top shelf: the front bead is from TruGlo, the walnut stocks are from Minelli, the microcell recoil pad is from Cervellati, the Cerakote is from Cerakote, and the custom hard case is from Megaline. Many inertia or “kinetic” action shotguns struggle and choke with light loads. Not so with the Masai Mara, for it not only handles slow 1 oz. loads, it handles them with flawless authority. Others have run their 7/8 oz. reloads through them, but I personally have no use for 20 gauge light loads in a 12 gauge. Try as I might, there isn't much to quibble about with this gun. This Bronze Pure needs a trigger job, and it is going to get it. Some may well be satisfied with the factory trigger, but a 4 – 4-1/4 lb. trigger is what I need in a field shotgun. I've mentioned this before, but Bob at Precision Sports in Oshkosh, Wisconsin did a fine job with several triggers for me, but Bob has retired to chase women, race motocross bikes, or a bit of both. The synthetic Masai Mara models start at $799 MSRP, the walnut models start at $990 MSRP. Retay dealers set their own price. The patented "Inertia Plus" action comes with all models, as does the fitted Megaline lockable hard case, five choke tubes, gun oil, sling swivels, shims, and so forth. The Masai Mara is a clear upgrade from the Benelli M2, Benelli Montefeltro, Franchi Affinity, and related models. The current Retay Masai Mara is the best-looking, best finished autoloader you can buy for under a thousand dollars. The inertia idea is an old one, for the fixed breech inertia design was introduced in the Sjögren shotgun in 1908. The modern inertia shotgun was first made in 1969, the Benelli 121, using the Bruno Civolani patents purchased by the Benelli Brothers. Benelli failed within 14 years, being consumed by Beretta in 1983. In all of these years, not much has been done to improve upon the inertia action: it is if the firearms industry has collectively gone to sleep. The first Masai Mara that I tested was also the first Masai Mara that came into the United States. The ATF did a splendid job scuffing it up and apparently had a rough time putting it back together. The forearm collar was slip fit, and could easily be removed. The ATF did just that and forgot to put it back, leaving it flopping around in the case which they also customized a bit. From the original, the forearm insert has been improved and stays in place. The bead that I felt was just too darn big has been replaced with a smaller, more appropriate front bead. The biggest news of all is the Inertia Plus action, now awarded a formal patent just recently. All Masai Mara shotguns from 2018 on have this feature, so the Benelli Click is now just an unfortunate memory. It is the Inertia Plus action that has launched this shotgun from the very good to great category: it is an action that no other shotgun has, or can have. 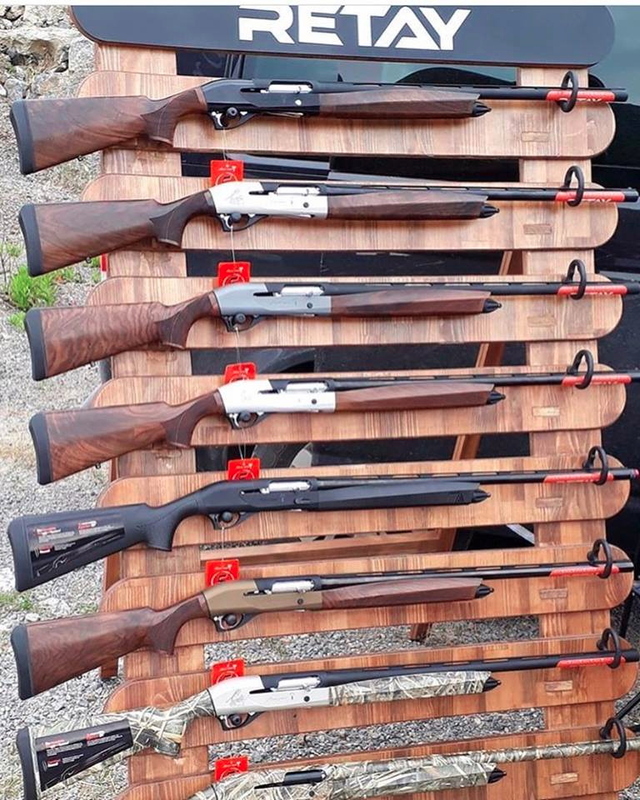 It is a rare event when you can actually get a higher quality gun for half the price, and to the great dismay of some Benelli blusterers, that is the case here. While they weep uncontrollably, you can laugh all the way to the bank. No one is going to be disappointed with the current Masai Mara. It makes most other inertia guns on the market look either miserably overpriced or poorly finished, which all too often is precisely what they are. See your local dealer, or contact chris@retayusa.com if you need help locating a specific model.